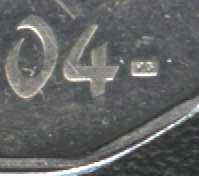 This coin was issued on 14th of December 2001. 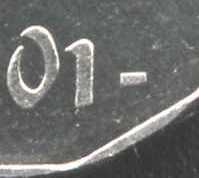 As you notice, two hyphens guard the year. 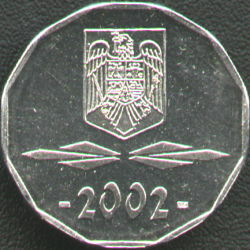 The right hyphen (2002, 2003 and 2004 coins only) has the initials V G incuse, standing for Vasile Gabor, the engraver's name. These letters are barely legible. 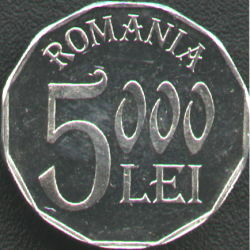 Yet very uglily and dully designed, it is still the first polygonal Romanian coin to enter circulation. 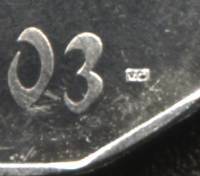 For sure this is the worst Romanian coin ever (closely seconded by the 500 lei of the same series). An interesting striking flaw - an iceberg! - is presented on the above picture. 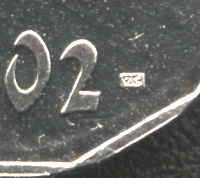 The flaw has been reported on several 5000 lei pieces of 2004, so it is not an isolated case but a repetive one. We have also found variants of the flaw that barely manifest it through a few isolated peaks - there is where the flaw must have commenced.